Frequent Monday theme, the vowel progression. Today’s iteration involves entries beginning with H?LL. A very nice touch is that all of the themers are single words, not phrases. Lengths of 10, 11, and 9 letters. 18a. [“Thank God Almighty!”] HALLELUJAH. We also would have accepted [Leonard Cohen song (notably covered by Jeff Buckley)]. 23a. [Of an ancient Greek period] HELLENISTIC. 35a. [Jed Clampett, e.g.] HILLBILLY. 49a. [Sauce made with butter, egg yolks and lemon juice] HOLLANDAISE. 55a. [Uproar] HULLABALOO. Also a 1960s television rival to Shindig! and American Bandstand. Seven-stacks vertically in the northwest and southeast. Dash of playfulness: 44a [Apt rhyme for “crude”] LEWD. Do not see also 58a [Polish hero Walesa] LECH because it isn’t pronounced that way—shame on you. 63a [iPhone assistant who says that “42” is the meaning of life] SIRI. 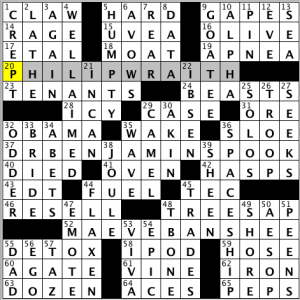 Note lowercase orthography in the clue. Non-theme double-Ls: 11d LA JOLLA, 39d DWELLER. 32d ELL, 7d ALL. Sure it’s a stretch, but this is a Monday and there’s never enough to talk about. 9d [Insurance company with a “spokesduck”]. Ashamed to confess that I plunked in GEICO before realizing the error and correcting it to AFLAC. Crossword insurance ennui. Hey AETNA, how come you don’t have an animal mascot? 47d [Seal, as a shipping crate] NAIL UP. Iffy. 34d [Patterns used for kilts] PLAIDS. Technical foul! A quartet of 15-letter spanners, each beginning with a member of some sort of quadrumvirate. More on this after the list. 17a. [What regular exercise helps maintain] PHYSICAL FITNESS. 27a. [Mindreader’s claim] MENTAL TELEPATHY. Isn’t that (unequivocally in-the-language) phrase redundant? 44a. [1980 Rolling Stones hit] EMOTIONAL RESCUE. 56a. [Priest or lama, e.g.] SPIRITUAL LEADER. With so much real estate occupied by the (very good) theme entries, there isn’t much room for amazing fill among the ballast, and this being a Monday means that nothing overly challenging or obscure SHALL (14a) appear, which further limits the constructors’ options. So it isn’t any surprise, nor a disappointment, that it’s more or less pedestrian. A pair of longish vertical entries lend a little jazz: WAIT HERE and PHONE TAG. Nothing else to say here. 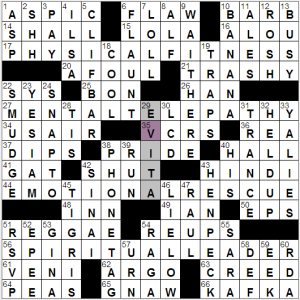 Uhm, healthy and stable crossword? Hello hello there! Is it Monday again?!? It’s almost as if it sneaks up on you every seventh or eighth day or something! Well, it is a Monday, and we have to get over it. Today’s puzzle, served up to us by Mr. Patrick Jordan, is a ghostly (and not ghastly) play on words. In it, the last names of three authors are slightly altered, and in place of them are similar-sounding words that also happen to be apparitions. PHILIP WRAITH: (20A: [Ghostwriter of “Goodbye, Columbus”?]) – From Philip Roth. DR. BENJAMIN SPOOK: (37A: [Ghost writer of “The Common Sense Book of Baby and Child Care”?]) – From Dr. Benjamin Spock. MAEVE BANSHEE: (52A: [Ghost writer of “Tara Road”?]) – From Maeve Binchy. Mistake of the day: initially typing in “well-armed” instead of WELL-AIMED (4D: [Like an expert archer’s shot]). Well, I guess if the archer had a few arrows in the quiver, then well-armed wouldn’t be too much of a stretch, huh? My GOATEE isn’t as long as one of our nation’s symbols, but with each passing day, I’m catching up to him in terms of gray hairs (9D: [Uncle Sam facial feature]). With the theme of the grid, including Henrik IBSEN, and the clue associated with him today, was very slick (22D: [“Ghosts” writer]). Rest of the grid wasn’t very tough, but thought I would just leisurely go through the different parts of the grid and not be concerned for time today. With that, I took a couple of minutes judging how hard the clue to HUMPTY would be to say three times fast (5D: [First name of a kiddie lit egg]). Answer: not too hard at all, at least for me. “Sports will make you smarter” moment of the day: SOLOS (25D: [“American Idol” performances]) – I had a hard time picking out a clue for this section today probably more than any other CS/WaPo crossword that I’ve done. But find one I did, and it concentrates on home runs with no one on base, or SOLOS. In 2011, the San Francisco Giants set the Major League record for the most consecutive solo home runs by a team, with 21. From July 7 through August 13 of 2011, the Giants did not hit a home run that drove in more than one runner. Just think about it: a whole month and change for a Major League Baseball team without hitting a two-run homer, three-run homer or grand slam? Yikes! Thank you so much for your time, and I’ll see you all on Tuesday! Good to see Brendan on Saturday at Lollapuzzoola! I had a good time, and the puzzles were delightful (my favorite was Tony Orbach’s puzzle #3, with doctored photos accompanying the theme clues). Placed 15th overall, which is not too shabby considering I had a wrong square in each of two puzzles (out of five puzzles total). Would’ve cracked the top 10 with one less error! I had considered solving in the Downs Only division until I remembered that the themes are so damn fun, I didn’t want to enjoy them less—and that it’s even more fun to finish early and so chit-chat in the church courtyard with puzzle pals. Came back from New York with an apparent cold, and today was a travel day, and I’m tired out, and I don’t think this puzzle was nearly as hard as my solving time would suggest. 1a. [Variant spelling for an eskimo boat recently added to the Scrabble dictionary (you’ll need at least one blank to play it)], QAJAQ. Kayak. Last week, did you read some of the breathless media coverage of the expanded list of Scrabble-legit words? 36a. [One who might enjoy being told to go to Hell], DEVIL WORSHIPPER. 44a. [Drops to the beat], TWERKS. Dropping your hindquarters and shaking your tush like a Polaroid. Didn’t know flora‘s plural was FLORES, didn’t know Brazilian soccer star David LUIZ, didn’t know DOOZER was a word, didn’t know the RUE DE / RIVOLI, didn’t know [“Riverdance” fiddler Eileen] IVERS. Didn’t love the puzzle with all this oddball stuff in it. This entry was posted in Daily Puzzles and tagged Andrea Carla Michaels, Bernice Gordon, Brendan Emmett Quigley, David Steinberg, Kevin Christian, Patrick Jordan. Bookmark the permalink. 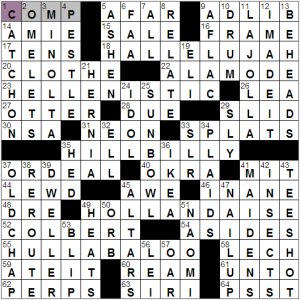 NYT: I love this duo of constructors, and I thought the theme, made up of single words, was a lot of fun. I never think of COMP as complimentary, I associate it with compensation, so it took a while to emerge. Rest was Monday easy. Favorite: Clue for Ikea. Seriously? Even though I think there is a lot of genius in this company, the thing that has always bothered me is that young people see their furniture as almost disposable. So cheap, it’s not worth moving from one NY apartment to another, much less moving from one city to another… This clue nailed it for me. They need to think more about conservation. COMP is a big word in the gambling world. So-called Whales (gamblers who gamble for $1,000,000 and more) get comped for anything you can imagination. I enjoyed the puzzle. When I think of Hallelujah, my first thought is KD Lang. She sang it when the Winter Olympics were in Canada. Here she is in another memorable performance. Leonard Cohen himself also sings it in a soulful way. I almost went with Bon Jovi ;) but Cohen prevailed. NYT: What a lovely puzzle! So well done. LAT: Another fun puzzle, and some great theme entries! I also had a hard time coming up with a description of this group of adjectives even though it was obvious what the theme was. Must have solved an earlier version of the BEQ. 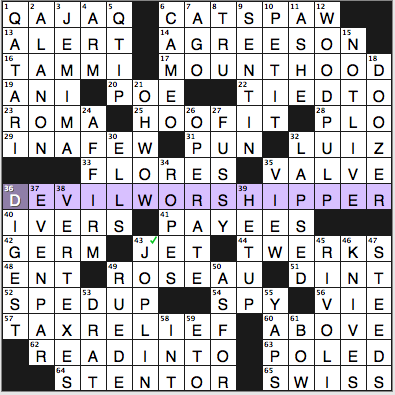 Both 27d and 36a were clued as [No Clue] and the “correct” answers were FUSTY and DEVIL WORTHIPPER. As you might imagine I was reluctant to blog it.